EuroMillions has a jackpot cap of €190 million. Once the top prize reaches this mark, it cannot grow any higher and special rules come into effect. Any extra funds which would have gone towards the jackpot are instead diverted to the next winning tier, and the top prize can roll over four times at €190 million before it has to be won in the fifth draw at that level. The EuroMillions jackpot rolls over every time it is not won and gets bigger in the following draw, and this continues to happen as normal as it approaches the €190 million mark. 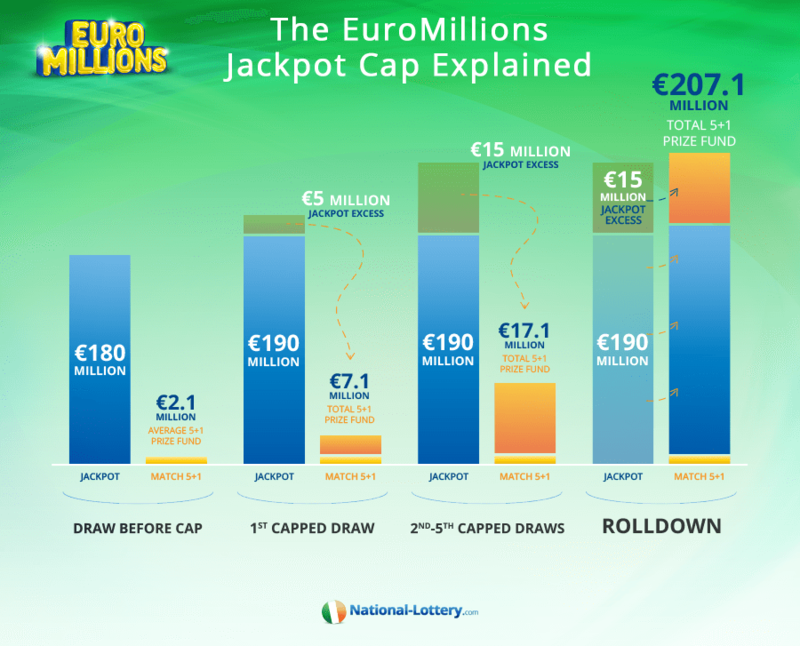 Once the jackpot hits €190 million, it is capped and will not grow any larger. In the first draw at the cap, any excess money which would usually go to the jackpot will instead go to the next tier in which there are winners. This is most likely to be the ‘Match 5 + 1 Lucky Star’ category, and the winning players in this tier would get to share a larger prize than usual. If nobody matches all five main numbers plus both Lucky Stars, the jackpot will remain at €190 million for the next draw and extra funds will again go to the next winning tier. This can keep happening if there are no winners until there have been four draws where the jackpot has been €190 million. If there still has not been a jackpot winner after the fourth draw at €190 million, then the money must be won in the following draw. If, in the fifth draw at the cap, there are no jackpot winners, players in the next highest winning tier will share the full amount, in addition to the excess funds, meaning that a prize of over €200 million could be split by ticket holders who have not matched the complete winning line. Once the jackpot money has been won, the top prize will be reset to its minimum value of €17 million for the next draw. When EuroMillions launched in 2004 there was a limit of 11 rollovers rather than a jackpot cap, and if nobody matched all five main numbers and both Lucky Stars in the 12th draw then the top prize would be split by players in the next winning tier. A jackpot cap of €185 million was later introduced in November 2009, and was reached for the first time in July 2011, at which point Chris and Colin Weir from the UK landed the top prize. Rules stated that the jackpot cap could increase by €5 million after being won and it subsequently went up to €190 million, before later being permanently fixed at this amount. The jackpot cap at this time was only allowed to roll over at €190 million for one draw before having to be won in the following draw. The first time the jackpot reached €190 million, in August 2012, it rolled over to a second draw and had to be won. Adrian and Gillian Bayford from the UK matched all five main numbers and both Lucky Stars to win €190 million. A player from Portugal also won €190 million in October 2014 when the jackpot once again reached the cap. In September 2016, the EuroMillions rules changed to allow the top prize to stay at €190 million for five draws rather than two. The jackpot hit its cap once again on Tuesday 3rd October 2017. It rolled on that occasion, before a Spanish player picked up the full €190 million in the draw on Friday 6th October.